When I finally finished my post-graduate degree last April, I felt lost. I had become so accustomed to such a high stress, sleep deprived, narrow focused lifestyle, that I didn’t quite know how to transition to “normal”, whatever that was. I actually thought that feeling stressed all the time, struggling to get out of the bed every morning, feeling like I couldn’t take another step after getting home from work was normal. I had never been able to keep to a fitness routine, either because of an injury or because I made excuses of why I didn’t have time to work out. Joining CrossFit was completely different. I became addicted, almost instantly. I loved the team atmosphere and personal coaching. I felt like my life was moving in a positive direction. However, despite my best intentions, I was still struggling with my daily energy level and how I felt in general. I had NO IDEA that how I was feeling could be related to what I ate. When I read Kathryn’s story on her website, I immediately related to her: I constantly felt hungry at 10:30am when I had breakfast at 8:30, I got constant “food headaches” and serious mood swings from eating late and not enough or skipping meals, and I would have ZERO energy at the end of the day. Kathryn helped me realize that how I was feeling was not normal, and by making some healthy changes I could dramatically improve my life. The breakfast test was one of the most eye opening experiences – I remember getting a phone call from my boyfriend around 1.5 hours into the carb heavy breakfast and getting angry over nothing. Carbs were making me a mean person! Kathryn has been such a positive influence in my life. Kathryn’s focus is not just on the food – it’s on the total person. She understands that people have different demands in their lives and works to make healthy eating manageable. She is a good active listener. By setting small goals each meeting, I was able to change my life in a direction I didn’t think possible before. It is amazing still how big of a difference choosing a protein rich breakfast makes in the outcome of my day compared to eating a bagel breakfast sandwich! I feel amazing and I owe that to making more consistent healthy food choices, getting 8 hours of sleep a night, and taking my fish oil, probiotic, and vitamin D supplements. I am really happy with my performance at the gym. Thank you Kathryn for being instrumental in helping me change my life! 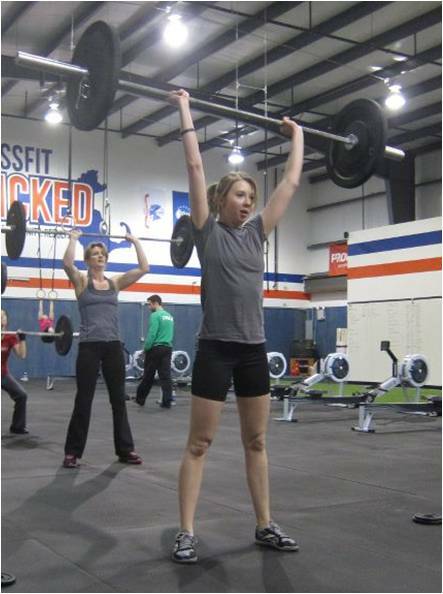 Feeling and looking strong, Jen rocks a CrossFit workout!